If you're craving a departure from your typical coffee brew, try snacking on coffee beans. You'll get the same caffeine rush -- and the positive and negative effects associated with caffeine -- along with beneficial dietary fiber not found in brewed coffee. But eating coffee beans also has some drawbacks that aren't associated with drinking brewed coffee, and if you snack on chocolate-covered coffee beans, you'll take in lots of calories and sugar as well. 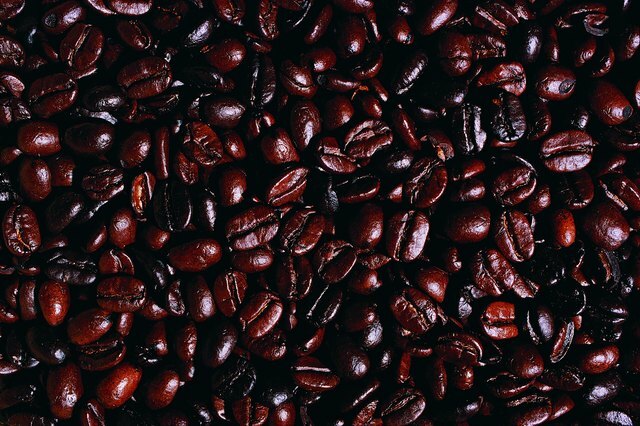 Snack on coffee beans and you'll boost your caffeine intake. That's a plus if you want a quick burst of energy -- caffeine stimulates your brain, so you'll feel more alert once it kicks in. Higher caffeine intakes also correlate with a lower rate of type-2 diabetes and Parkinson's disease, reports the Linus Pauling Institute. Taking in too much caffeine, however, can cause nausea, a rapid heart rate and anxiety. Keep your intake limited to between 300 and 400 milligrams of caffeine daily, recommends the Linus Pauling Institute. A serving of 28 dark chocolate-covered coffee beans contains 336 milligrams of caffeine. Like most plant-based foods, coffee beans serve as a source of fiber. Each serving of chocolate-covered coffee beans -- 28 pieces -- contains 3 grams of fiber. Fiber increases the bulk of your stool as it passes through your digestive tract, a process that fights constipation. It's also good for weight control -- fiber absorbs water in your digestive tract, helping you feel full. Snacking on a serving of chocolate-covered coffee beans accounts for between 12 percent and 14 percent of the fiber intake recommended daily for women -- and between 8 percent and 10 percent of the recommendations for men. Coffee beans do have drawbacks compared to filtered coffee. They contain two compounds -- cafestol and kahweol -- that raise your cholesterol levels, including low-density lipoprotein, the "bad" cholesterol. Filtered or percolated coffee, along with instant coffee, typically contain only low levels of these compounds and therefore have less of an effect on cholesterol. Coffee beans are also high in oxalates, a family of compounds that can cause health issues for people who form calcium oxalate kidney stones. Coffee beans contain 11 to 36 milligrams of oxalates per 100 grams, compared to just 0.9 milligram in brewed coffee. If you're snacking on chocolate-covered coffee beans, you'll also want to watch your calorie and sugar intake. A serving of chocolate-covered beans contains 216 calories -- enough to make you gain over 6 pounds if you ate them twice a week for a year in addition to your regular diet. Each serving also contains 17 grams of sugar -- a significant amount toward the daily 24- and 36-gram limits for women and men, respectively. Try snacking on plain coffee beans. It's still important to practice portion control due to their caffeine content, but you're less likely to overdo it on your calorie intake.